Another shot from Gardens by the Bay, featuring a Dark Glassy Tiger feeding on the Marigold flower. 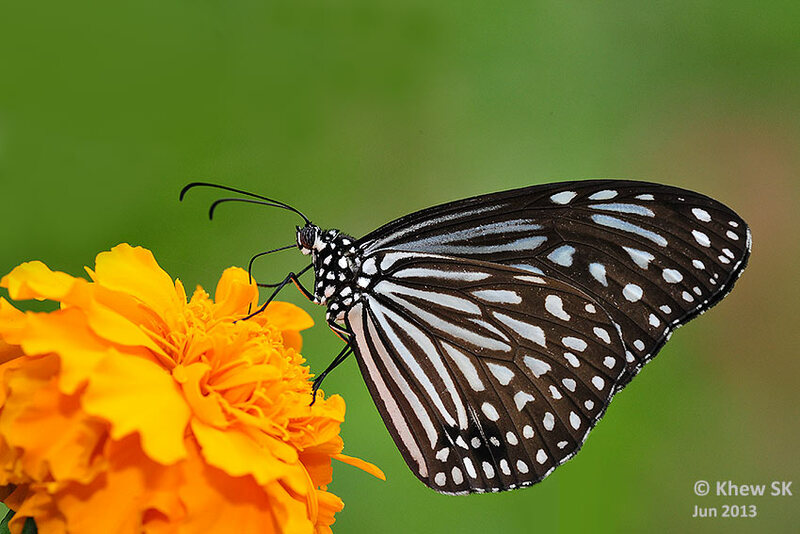 One of the ecological roles played by butterflies is that of a pollinator of flowering plants. When the butterfly inserts its long proboscis into the flower of a plant, it brushes against the pollen-carrying stamen of the flower. When it next visits another flower of the same species of plant, it transfers the pollen onto the pistil of the other flower, thereby aiding in the pollination and the process of fertilisation. This process allows the plant to bear fruit and eventually seeds for the next generation of plants. 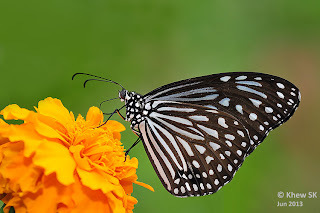 Without pollinating agents like butterflies, moths, bees, wasps and other insects that are attracted to the flower for its nectar, many plants will not be able to bear fruits.